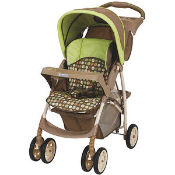 Our Stroller Deluxe is perfect for the family on the go. It features a padded seat with harness to keep your child secure, 2 position back for reclining, one hand fold down, and parents tray for storage. For children up to 40 lbs. Colors and styles may vary.